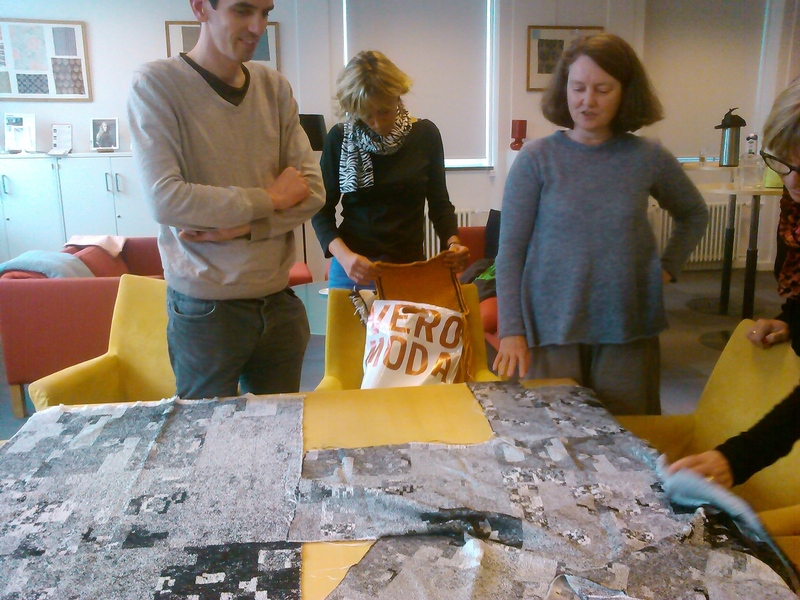 Last week the weavingcodes/codingweaves project started with a trip to Denmark, our first stop was the Centre for Textiles Research in Copenhagen where we presented the project and gathered as much feedback as possible right at the beginning. The CTR was introduced to us by Eva Andersson Strand, and is an interdisciplinary centre which focuses on the relationships between textiles, environment and society. Here is a manual translation of the interview with Ellen on L.I.S.A. Alex McLean will talk about the Weaving Codes, Coding Weaves project at Make:Shift, a biannual conference of Craft Council UK. This will be part of a session called “Sonic Pattern and the Textility of Code” with Becky Stewart and Claire Pajaczkowska, and follows on from a highly successful earlier day of talks and performances of the same name organised by Alex McLean and curator Karen Gaskill. Book tickets here. Alex McLean and Dave Griffiths will perform music informed by the first stage of the Weaving Codes, Coding Weaves project at the Cheltenham Literature Festival, on the 12th October. They will join AHRC Digital Transformations Leadership Fellow Prof Andrew Prescott, for discussion about the emerging digital arts practice of Live Coding and how it connects with the ancient craft of weaving. For more information and booking information, see the Cheltenham Literature Festival website. Through the AHRC Digital Transformations “Weaving Codes, Coding Weaves” project we will connect the ancient practice of weaving with the emerging practice of live coding, exploring ways in which ancient mathematical thought may be exposed, as well as forming a rich view of contemporary digital arts. Ancient weaving looms may be considered early digital art machines which in Greek Antiquity prefigured concepts of dyadic arithmetic and logic. Live coding is an emerging digital arts practice which unravels technology in order to use computer programming languages for live expression, for example to create improvised music. The connections between these practices are as unexpected as they are rich, finding ancient principles of woven pattern embedded in the very notion of computation, and human relationships with material extending into creative work with technical language. You are welcome to join us for our project launch seminar in Leeds. The event will be chaired by Dr Kia Ng, with discussion lead by the following project participants exploring such themes as the Textility of Making, Penelope’s loom, the Mathematics of Weaves, Patterns in Computation, and Live Coding. An interview with project investigator Dr. Ellen Harlizius-Klück has been published on L.I.S.A., a website published by the Gerda Henkel Foundation, introducing her work with focus on the Weaving Codes, Coding Weaves project. The interview is in German, and an automatic translation to English is available here. Welcome to the blog of the Weaving Codes, Coding Weaves project, funded by the UK Arts and Humanities Research Council, where we will share news and announcements. We also have a page with information about our project, and our research team, as well as our planned events.